ECO-MUSEUM OF THE GREAT WAR. THE MONTE GRAPPA 7TH NATIONAL RALLY BY CAMPER Monte Grappa, you are my homeland - the centenary rally "Monte Grappa you are my homeland" is not empty rhetoric ... the beginning of the song. The Monte Grappa represented truly the symbol of united in the effort to win the tough comparison with the Austro-Hungarian Imperial Army. After forty months of terrible battles in the highlands of Vicenza, right on Grappa, in 1918, you had the feeling of being close to the victorious conclusion of a devastating conflict.The Veneto plain was about to become a battleground in the hypothesis that the Austro-Hungarians varcassero the Venetian Alps, or the mountains or by the Piave. Thus began the epic battle on Grappa stop decisive for the fate of Italy, touching moments of high tension and authentic tragedy. The Grappa became the glorious symbol of the Italian victory. The October 24, 1918 scoccava time of the decisive battle on the enemy opposed Grappa an angry resistance but it was the last gasp of a wounded giant. On October 31, the enemy exhausted and helpless withdrew from the Grappa to go up the valleys where it came from. On November 3, the flag was hoisted on the rubble of Asiago; November 4 the first Italian flag entered in Trento. The war was over. The Monte Grappa is inextricably linked to the city of Bassano. During the Great War was the main logistics center after the defeat of Caporetto and the entrenchment in the mountains. With the entry into the US war in 1917, a young journalist, a volunteer of the "Red Cross" for the emergency services, had as its basis Cà Erizzo Bassano: he was Ernest Hemingway. Recently opened museum Hemingway just Cà Erizzo. Bassano is certainly one of the most romantic and charming of Italy: the most famous monument is undoubtedly the Old Bridge, designed by Andrea Palladio, better known as "Ponte degli Alpini". All this will be the subject of "SEVENTH NATIONAL MEETING CAMPERISTI" organized by the "Camping Club Vicenza", 26 to 28 June 2015, with the collaboration and support of the City of Bassano, the province of Vicenza and the Veneto Region. Welcome drink and lecture by a history of the events of the Monte Grappa. 8.00 - Departure by bus to the Monte Grappa and guided tour of the historic sites. Moment of Remembrance at the Shrine of Grappa. 12.30 - Snack noon in Refuge. 16.30 - Visit to the Museum Ernest Hemingway in Cà Erizzo in Bassano. 19.30 - Dinner in the Barracks Monte Grappa. 8:30 am - Visit to the town of Bassano del Grappa. 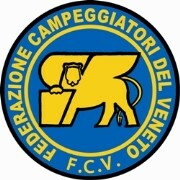 The FCV was born in 1973 called Unione Regionale Veneta – Federcampeggop. It’s no profit Association. The FCV organizes, promoter and coordinates camping’activities and plein –air turism in collaboration with membres CIC Veneto Clubs.